Any talk of Irish pubs in St. Louis is sure to include O'Connell's. 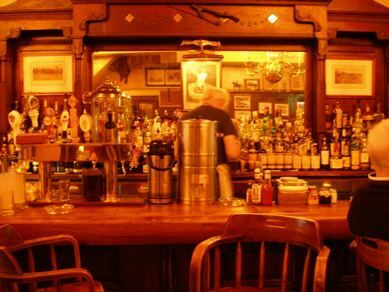 The popular restaurant and bar has been serving up casual food and cold Guinness for decades. O'Connell's is a favorite destination for locals looking for a good burger, fish & chips or onion rings. O'Connell's is located at 4652 Shaw Avenue in south St. Louis, just south of I-44 and Kingshighway Boulevard. The kitchen is open Monday through Saturday from 11 a.m. to midnight, and Sunday from 11 a.m. to 10 p.m. If you're going just for drinks, the bar stays open even later. Bar hours are Monday through Thursday until 1:30 a.m., Friday and Saturday until 3 a.m., and Sunday until midnight. You can reach O'Connell's at (314) 773-6600. One word you won't hear used to describe O'Connell's is "fancy." This place is the epitome of casual, from the food to the decor. O'Connell's has been open in its current location for more than 40 years, and the well-worn look is part of the charm. The space is actually divided into two areas. As you walk in, you'll be in the bar section. This area is dominated by a classic wood bar along one wall. There are stools and a few tables as well. It's the perfect setting for sharing a few pints or whiskeys with friends. If you know a bit about Irish history, you'll recognize the picture of Michael Collins hanging prominently behind the bar. The restaurant section is a bigger area filled with dark wood tables and booths, tin ceilings and antique light fixtures. There's a large table in the middle of the room that can seat larger groups. The rest of the seating is mostly for parties of four to six. O'Connells offers a simple menu of pub grub that hasn't changed much over the decades. A top choice for many is the burger, which often ranks at the top of local foodie polls. The burger is nine ounces of grilled beef cooked to order. The toppings are simple. No caramelized onions or goat cheese here. You can get onions and pickles, but no tomatoes. O'Connell's bans the use of tomatoes as a condiment. Apparently, until tomatoes taste great all year long, they won't get near an O'Connell's burger. Right behind the burger in popularity is O'Connell's roast beef sandwich. Sliced to order, the roast beef is fresh, pink and lean. It's a filling sandwich that goes great with onion rings. Specials are offered for each day of the week, with fish & chips packing the pub on Friday nights. Fried mushrooms stand out among the appetizers, just make sure to order a side of the homemade Mayfair dressing for dipping. Newcomers may be surprised that O'Connell's doesn't have Irish music like many other pubs around town. You can find great Irish music at McGurk's in Soulard, but that isn't what O'Connell's is all about. The key to success for an Irish pub like O'Connell's is its ability to encourage conversation and make guests happy. Judged by these criteria, O'Connell's is the perfect destination. St. Louis offers a great variety of dining options for all tastes. Be sure to check out, the Top Italian Restaurants on the Hill, the Best Breakfast and Brunch Spots in St. Louis or any of the Foods Made Famous in St. Louis.